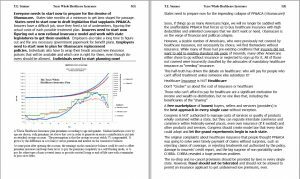 In the article State-Based Healthcare Insurance we discussed what healthcare reform should have done instead of Obamacare. Federal over-reach of a national agency to manage all the healthcare and insurance companies is just another problem, as we have created under Dodd-Frank for financial and lending industry. But that should be an obvious consequence of allowing interstate insurance practice. Who would regulate insurance carriers who cross state lines? Of course! We need a Federal government regulator for all insurance because it’s now interstate under Obamacare. Never mind the 10th Amendment’s prohibition of the Feds usurping power left to the States, like taking over state-based insurance (it’s not an enumerated power). But neither is making all insurance carriers eligible to compete across state lines likely to enable a better solution for insureds as a replacement for Obamacare (PP&ACA). First, if a carrier cheats an insured in another state, which one of the states steps up and enforces the law, or can only the Feds do that? It’s a regulatory nightmare. Carriers themselves, moreover, won’t want to be subject to both California law and Minnesota law, unless they’re just masochistic. And, what carrier would want to buy into a market they know nothing about, expand or create a network of physicians, hospitals and providers in a location they’re unfamiliar with? It is absurd to think a carrier would jump into an out-of-state market – it would occur slowly, if at all – to prevent carriers from entering to compete only to exit when they fail. Obamacare’s collapse is imminent. The millions who got discounted insurance and got covered for pre-existing conditions will be faced with either complete loss of insurance coverage or higher costs compared to those without pre-existing conditions. The 50 state laboratories will have to come up with solutions for the poor and those faced with higher premiums for those with pre-existing conditions. Some possibilities are that a state offers healthcare, not insurance, to the impoverished. After all, public health departments have existed for decades, as well as free clinics. Maybe some charities would fund treatments for those with pre-existing condition conditions. Perhaps some states will offer state insurance for those unable to get commercial insurance, like FAIR for homeowners. States could even fund other methods of paying for those with pre-existing conditions, such as taxation of tort attorney fees – seems fair. Soon, if things go as many Americans hope, we will no longer have to worry about PP&ACA (Obamacare) forcing us to buy unaffordable healthcare insurance with high deductibles and coverages that we don’t want or need. Obamacare is on the verge of financial and political collapse. However, a sizable number of Americans, who were previously not covered by healthcare insurance, not necessarily by choice, will find themselves without insurance. While many of those uninsureds had pre-existing conditions that insurers did not want to add to existing standard risk pools of insureds, many other Americans either chose to go without insurance or neglected to sign up for it. All of those uninsureds were incorrectly classified by the advocates of mandatory healthcare insurance as “needing” insurance, when they actually needed healthcare. This half-truth about “need” has driven the debate on healthcare: who will pay for people who can’t afford treatment, unless someone else subsidizes it? Besides the moral and legal question of how to subsidize some but not all Americans, which would be a violation of Equal Protection, other issues have simultaneously caused a lot of debate, like should medical treatments that some find immoral or morally offensive be subsidized by those who are offended? Should someone unfairly be forced to pay for services she or he will never need in order to subsidize those treatments for someone else? A free market doesn’t have such quandaries. Only a market controlled by bureaucrats suffers from such dilemmas as who pays for what and how much. Those who quickly signed up under the Obamacare plans were promised reductions in premiums of “up to $2,500 per year for a family” by Obama – this just didn’t happen, and simply cannot happen. Yes, many Americans were “Grubered” into believing in the tooth fairy. The included services mandated by PP&ACA are so extensive that reductions of premiums just cannot happen either. Moreover, adding in known-risk insureds (with pre-existing conditions) raises the expenses of the baseline pool enormously. A law predicated on lies must be revoked and put to a vote again. Unless states prepare now for the coming chaos, Congress will override states and enact a patchwork of tax credits, insurance subsidies and tax rules to further complicate our lives and “ease” the change back to state-regulated insurance in a more free market. This is the wrong approach. Federal purview is only over interstate matters, not those things wholly contained within a state. States need to step up now and plan for the post-Obamacare time. Insurance carriers need to work with state regulators and legislators to find solutions that will address the various aspects of healthcare insurance that most people viewed as broken. We need the states to do what they do best: explore different solutions independently without a top-down “solution” forced on us from Washington. That’s right. Obamacare “guaranteed” that insurers make 20% margin on premiums received. Until its passage insurers weren’t guaranteed a return or margin at all. Remember, besides statistics, accounting is a game of numbers that often obscures the truth. It is laudable for regulations to prevent an insurer from refusing to accept an applicant to be insured because they have a pre-existing condition. But forcing insurers to accept insureds with known pre-existing conditions violates the underlying principles of insurance. The policy premium for a group is simply the number of insureds in the group multiplied times the sum of all costs of covered perils for the premium period. Of course an allowance for variance in treatment costs and for profit needs to be included. Pre-existing conditions represent a 100% risk of claim for the cost of treatment of that condition. By mandating coverage of pre-existing conditions within the normal risk pool, the rates to cover the pool will rise automatically to account for the 100% as opposed to normal risks, such as 12 in 100,000 or 0.012% for example. Of course every risk has its own statistics in the population, but never 100%. We do need input from insurance carriers on a fair way to deal with insureds who make excessive claims as opposed to those who don’t, because it may indicate the insured is in the wrong risk pool. .Dropping or canceling a policy simply because it had too many claims, unless fraud or deception was involved, isn’t the right answer. The issue may be the lifestyle or work environment of the insured. Each risk has its own cost of treatment and efficacy of the treatments associated with it. If caught early enough through aggressive detection regimens, a treatment might be very cheap, but then the detection regimen costs more. If detected late, the treatment may be very expensive or even ineffective. Different treatments at different stages of the condition present different costs to the insurer. If a preferred treatment costs a known amount on average, the insurer should be able to recoup that average cost from the insured, if the condition is known at the time of application. The insured with known pre-existing condition could then decide does the average cost of treatment for that insurer reduce their overall cost or should they risk paying more or follow a cheaper treatment regimen from another insurer with a different result profile. This choice should be the insured’s. Actuaries study these trade-offs to determine the least cost for the insurer. Pre-ACA the least cost was simply to drop the insured’s coverage. If the insured was in a group plan, they had to weigh the bad publicity with the employer (group) against the cost of not dropping the insured. The group administrator could threaten to terminate the group policy for refusing a legitimate claim. A policy rider for the known condition could then be added to the individual’s policy at a known premium add-on. Insurers can then compete with each other over the premium add-ons of treatment plans and costs for known conditions. Since insurers look only at costs and efficacies, doctors, hospitals and pharmacies need to come up with treatments that are effective and low cost, not insurers. Insurers that work with healthcare providers, like doctors and drug companies can compete over the most efficacious and least costly treatments and detection methods for a known condition. An alternative to a rider for a specific condition could have been to move the insured from one risk pool to another with the 100% cost of treatment fully accounted for in the insured’s premium. But, firstly, insurers typically offer only standard and premium policy rates, although some offer sub-standard risk policies. All of these risk pools are based on random distributions of risks. Insurers should be allowed to set up both riders for known conditions and higher-risk (sub-standard risk) pools with appropriately higher premiums. Unless the insured lied, he faced the exact same perils as other insureds and he should not be forced out of the risk pool he joined. To encourage insureds to apply and keep insurance it would be unfair to long-time insureds to be dropped or forced into a sub-standard pool with higher rates merely because the insured discovered he had a condition. On the other hand it is unfair to the other pool members to allow a new member with pre-existing condition to join and raise their premium costs, especially if the newly insured had no insurance before but joined effectively only to get a discount from the average cost of treating his condition by lying about its existence. The whole concept of “open enrollment” is crazy. If the insured had wanted to set aside some funds in case a condition was discovered later that he needed to pay for in full or via a higher premium, this was not possible, at least tax-free. The issue of how often an insurer may re-rate an insured as to the correct risk pool needs proposals from insurers so that regulators and legislators can establish “fair” methods. For example, regulations might preclude re-rating for 2 years or dictate a 5-year phase-in to the new pool premiums, or some other method. Besides setting aside money in case of a change in rating in the attached savings accounts is a good idea. Josh Withrow and Logan Albright have penned an article on Freedom Works, which Pattie Curran features on her website entitled “Ten Principles for Replacing Obamacare” http://catholicteapartyhippie.blogspot.com/2015/03/ten-principles-for-replacing-obamacare.html . 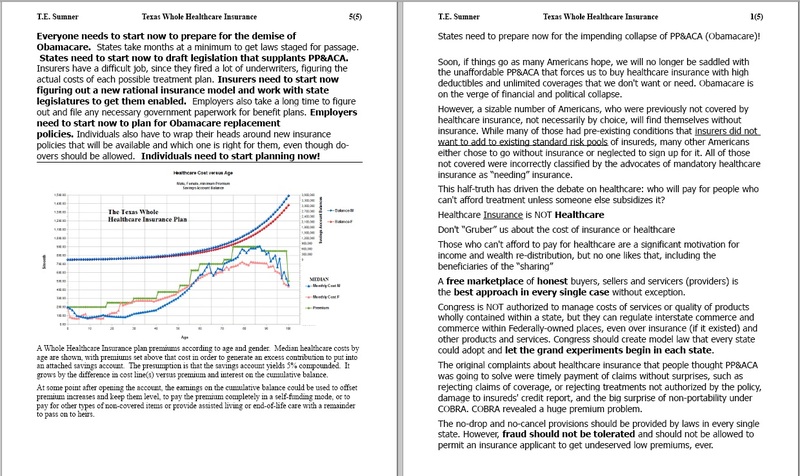 The article reviews some important points about healthcare insurance and the Patient Protection & Affordable Care Act. In addition to these principles, when states finally do step up and try to craft their own solutions in the grand “laboratory” of the united States, they’ll need to consider some additional points. Note that in the interest of “fairness” when insureds make lifestyle choices or employment choices that increase their likelihood of making claims, insurers should be allowed to counsel and eventually raise premiums for those insureds. Freedom of Choice is crucial to the proper functioning of a Free Marketplace. Freedom requires removal of force or compulsion of any type to keep the playing field level. In addition, all forms of deception or fraud have to be rooted out in order to keep the marketplace fair. However, a truly competitive healthcare marketplace and a competitive insurance market for healthcare won’t be possible until some other things are changed. Employers voluntarily created the connection between employment and healthcare benefits decades ago (WWII). There is an economic benefit to having a business bargaining on behalf of a group of customers or employees for lower prices. But forcing employers to provide healthcare insurance is irrational and wrong-headed. It is especially troubling that small employers with only 50 employees are mandated to provide it, since it likely takes a new full-time employee just to manage a program. A new employee would add about 2% to labor costs, subtracting directly from the bottom line. This puts small employers at a distinct disadvantage to large ones. A much higher threshold should be chosen if a mandate is to be set by law. Any threshold for requiring an employer to do something should be set high enough so that its effect on the bottom line is negligible. A 50-employee threshold is not negligible. A 250- or 500-employee threshold seems more negligible. Forcing employees to take up a particular set of coverages or only from a particular insurer is truly anti-competitive. If the employer subsidizes the insurance premium at all, that subsidy should be disclosed to the employee, and in the event employment terminates or otherwise changes the subsidy, the employee will know ahead of time the actual insurance premium. COBRA coverage has revealed this issue. People like “shopping” as long as the choices make sense and no huge penalties accrue to making a mistake. So, if you’re locked into deducting a certain amount because you selected (for example) excluding pre-natal care, you would want to be able to change your mind later, if needed, by paying the difference down the road when you find out you do need it. This also applies to the maximum coverage amount, even if an infinite limit is not available. Give insureds the Mulligan rule for applying for insurance coverage. This knowledge of the premium in employer-based healthcare insurance plans is critical, because policies (even though negotiated through the employer) should belong to the employee and become portable in the event of layoff or termination. Insurance should “belong” to the employee, even though the employer helped negotiate a lower price for it. Let the employer negotiate on behalf of the employees and certify working environment/job descriptions for employee, but otherwise we need to remove employers from their mandatory role in healthcare insurance. Of course taking the negotiated rate to another job or lifestyle might result in re-rating the insured. Employers typically also supply a benefit commonly called a Flex Savings Account. This money is made available each year and can be used for things like deductibles, eyewear, dental and the like. However, the Flex account is emptied every December 31. 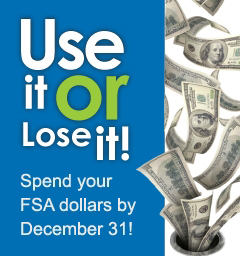 Many employees rush to spend their Flex dollars on things they don’t truly need only because the money will disappear at year-end. These dollars should never be lost to the employee. 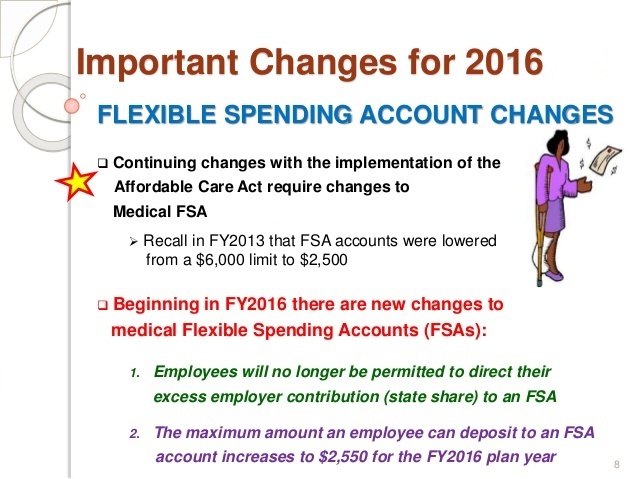 But employers simply pocket the money to apply it to the cost of “administering” the Flex plan. 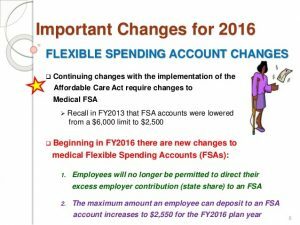 PP&ACA lowered the tax-deductible contributions while extending by 75 days the spending deadline. Frankly, it makes no sense that insurers do not offer optometrist and optician coverage, nor orthodontic and dental coverage, if they wanted to. I guess your eyes and your teeth are not medically connected to your body. Imagine. Regardless of what the employer wants covered, the employee should be able to get coverage for everything he wants, even massage therapy, psychologists, acupuncture, shaman prayers, midwives, or whatever. Freedom to choose is crucial to a free market. allow others to make “gift” contributions. Savings accounts should totally, completely be free of taxes, state, local, Federal, and all contributions should similarly be tax-free. In addition, growth (interest, dividends or returns) on the policy should remain tax-free and fee-free. If a nominal fee is allowed, every insurer will charge that. So, perhaps none should be allowed by regulators. Like Whole Life policies, returns should be offered by the insurer and chosen by the insured. Today annuities offer fixed returns guaranteed with a ratchet mechanism in the stock market returns more, or simply fixed returns of various amounts, and so on. Let’s let the market decide what kind of return on the savings part is reasonable. Insurers can decide how to manage withdrawals for proper uses of the account. Primarily the savings account can be used for deductibles, un-covered items, electives, eyewear, dental, and so on, but it never disappears and is never taxed away. Later in life insureds may want to use it for hospice or assisted living costs or funeral costs or else just leave it as a legacy to their heirs under similar restrictions, like an IRA. Note that unemployment should not leave an ex-employee without healthcare insurance, especially if money is available to pay premiums in the savings account. Whole Life Insurance often has a conversion possible to make the savings fund the insurance (endowment). “Whole Healthcare” Insurance should also have that possibility. Like Whole Life Insurance, Whole Healthcare policies should be flexible. But more importantly, they should reflect reality. If the cost of healthcare on average rises over a lifetime, then premium payments should, too. If a characteristic, like a pre-existing condition, differentiates one insured from other insureds, it is only logical to charge them only for their differences. Without knowledge we cannot improve. With knowledge we can improve and prepare for future needs. Hiding politically inconvenient truths is unacceptable. At least let us make a conscious decision about coverage. The attached savings account for a “Whole Healthcare Insurance” policy grows with each premium and from returns on earnings. Other contributions can make the savings account grow, too, like FLEX dollars or voluntary contributions, but primarily the account increases by the difference between actual healthcare insurance costs and premiums paid. A typical insurance contract may return 5% per annum by contract. 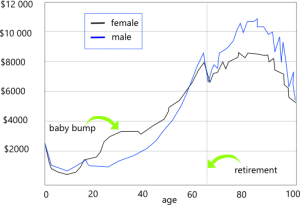 That growth is reflected in the upper portion of the image, reaching millions over a lifetime. 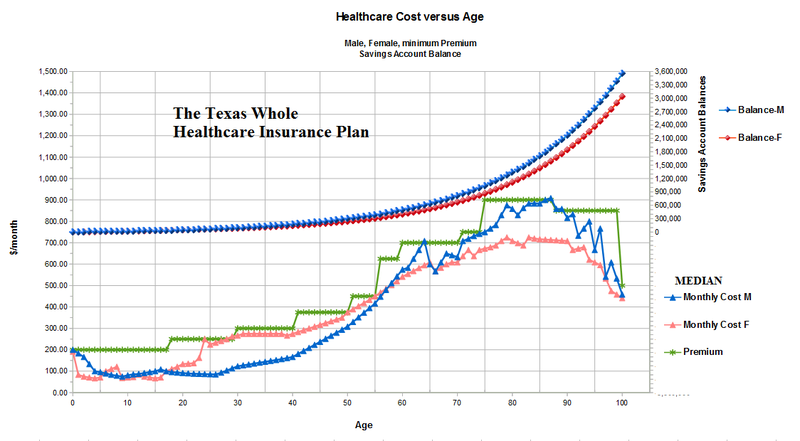 Green line is the suggested premium, which lies above the insurer’s actual annual cost of providing healthcare insurance after setting up a network of providers and negotiating rates with them. Note that despite political correctness the actual median cost of providing healthcare for females (orange line) is different from that for males (blue), not just longevity. The savings balance can become an endowment fund for future healthcare. 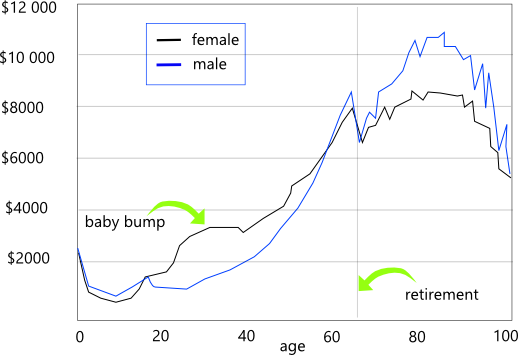 If premiums are paid only up until about age 35, the savings account will last a lifetime, but of course the savings account in this case would be depleted over the remaining life of the insured. But, end-of-life care may become a significant factor and need to be paid out of the “healthcare” savings account. So, the policy owners may want to have assisted living in later years covered by the policy, or at least by the savings account. Alternatively, the savings balance may be shared by a family and passed on as a legacy to children or other insureds on the common policy. It is conceivable that a savings account might be shared and passed down for several generations, and if large enough, become an endowment for family healthcare insurance. Someone owns an insurance policy. Today, employers own most healthcare policies as group policyholder. While employers, as mentioned, can and should help negotiate group rates for their employees, the policies belong to the individual employees. This means the coverage and terms are under the control of the employee. For Whole Healthcare Insurance it does not seem fair to other risk pool members to add more insureds without collecting additional premiums. New children, a new spouse, even adding extended family members to a policy should not be simply a matter of listing them on a family coverage policy. Premiums should reflect costs. Keeping a child on a policy beyond the age of majority should not be prohibited, but the cost of continuing coverage should change. Insureds should be allowed to add anyone to a policy by paying the appropriate premium, family member or not. While age is a factor, lifestyle and profession also matter. 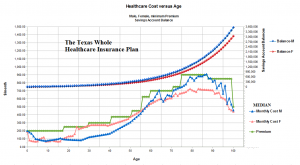 AEI studies show that the cost by age of healthcare falls to a minimum around age 26 and rises after that age (except for females). The government’s denial of gender differences in healthcare costs is revealing. Making a political issue of a fact of life is insanity. If an insured wants coverage for gender identity issues, then they should be able to purchase an additional rider for that purpose. Cosmetic surgery and other treatments that generally fall outside typical policies should be available for add-ons. Insurers should be free to differentiate or not as their marketing and sales data dictate. Law should establish how costs among multiple insurers, each associated with a family member are to be allocated and shared. It is important to note that pregnancy, abortion, birth-control pills, gender changes and the like disappear when the insured chooses what coverages the insured wants, not the government. In many cases charities have successfully managed healthcare services for impoverished people, and hospitals and public health departments have offered programs to reach out to the poor. In some cases families have made appeals to philanthropic individuals and organization to pay for healthcare procedures they could not afford. It is important that the legitimacy of such claims be verified to prevent abuse and fraud, preferably by attestation of the diagnosing doctors. Doctors themselves are a huge source healthcare treatments, often on a pro bono basis. The state has an interest in keeping this work protected from financial liability as well as encouraging medical personnel to participate as caregivers. While some “Samaritan” laws do exist, these need expansion to provide coverage of the facility and personnel and other providers who so selflessly give of themselves. This includes teaching schools as well as free clinics. The state should also consider contributing a portion of lottery revenues to a fund to support these charitable activities. A sizable portion of lottery revenue is actually derived from the indigent, who believe they can “win” their way out of poverty. In effect, they would be helping to fund their own care. Note that tort reform to limit liability of care given in good faith is needed. Many have advocated for general tort reform to limit claims against all medical practitioners. The best guideline here is the self-selected maximum benefit an insured has for his own insurance policy should be the limit on liability. Besides changes to the state insurance regulations, more free-market forces need to be unleashed on the healthcare industry, too. First, pharmacy laws are overly restrictive. FDA must “approve” a treatment, implying by law that it’s “safe and effective” but frequently drugs are recalled as unsafe, even after years of regulatory rigmarole to assure their safety, and drugs available in Europe are never released into the American market. This is insane. If someone wants to take a risk with a drug, why is he not allowed to do so, provided he is actually made aware of the risks. A stamp of approval should be replaced by fairly simple labeling that conveys risks as probabilities plus sensitivities for identifiable groups. Once this re-labeling is completed according to state law, pharmacies could dispense any drug to any adult who signed the appropriate disclosure without fear that the dispensary could be sued. If manufacturers or compounders lie, let them pay for their deception. Now no one pays, not even the FDA, when approved drugs turn out to be snake oil. If pharmacies violate laws against dispensing to minors or without getting a risk disclosure signed, then let the pharmacist spend time thinking about it in jail. Adults should also have their choice of treatment by board-certified doctor, licensed nurse, certified midwife, emergency medical technician, practitioner with some industry certification, holistic medicine guru, acupuncturist, massage therapist, soothsayer, or chiropractor. But of course, if insured, self-treatment or unauthorized treatments could result in loss of coverage by the insurer. If only licensed hospitals and doctors can treat people medically, then competition is limited to whatever population of doctors there is. Supply limitations always drive up prices. Moreover, the common practice of not posting prices for drugs and treatments should be prohibited by law. Every pharmacy receipt should show the actual price of the prescription before insurance payment or other discount. Every medical practitioner, including municipally-owned ambulances should similarly be required to post their prices and any discounts available and which insurance plans they accept as partial or full payment. We shouldn’t need a Federal law to require this, unless they’re interstate. Knowledge is a powerful weapon in the fight against over-pricing and necessary for making rational choices in a free market.